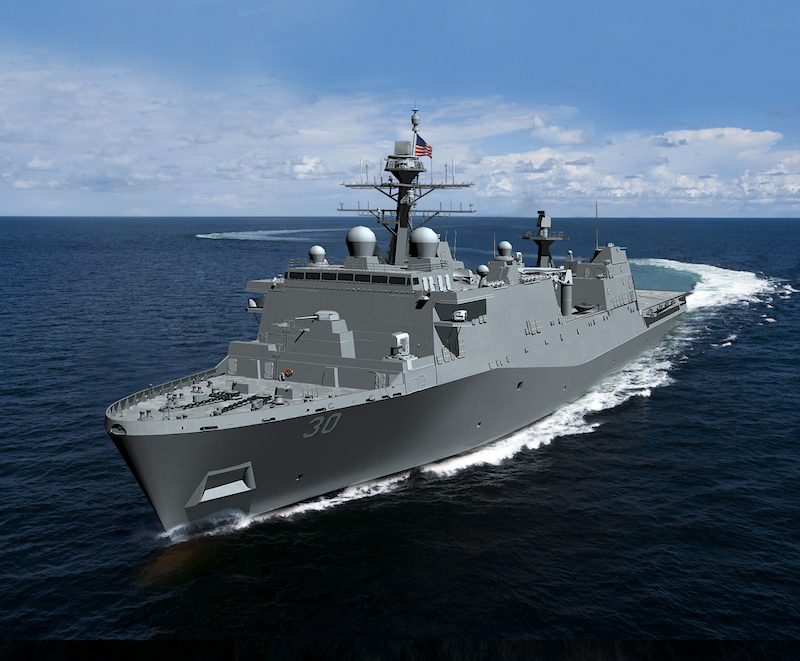 LPD 30 will be the first ship of the improved Flight II series of the LPD 17 Landing Platform Dock amphibious warfare ships, and 14th ship of the class. Huntington Ingalls Industries, Pascagoula, Mississippi, was awarded a $1,471,290,677 fixed-price-incentive modification to previously awarded contract N00024-18-C-2406 for the procurement of the detail design and construction of Landing Platform Dock (LPD) 30, the first LPD 17 Flight II ship which will meet all the capabilities and capacities requirements for the Amphibious Ship Replacement. Work will be performed in Pascagoula, Mississippi (82 percent); Crozet, Virginia (3 percent); Beloit, Wisconsin (2 percent); and New Orleans, Louisiana (2 percent), with other efforts performed at various sites less than one percent throughout the U.S. (11 percent), and is expected to be completed by February 2025. Fiscal 2018 shipbuilding and conversion (Navy) funding in the amount of $1,369,362,790 will be obligated at time of award and will not expire at the end of the current fiscal year. PASCAGOULA, Miss. --- Huntington Ingalls Industries announced today that its Ingalls Shipbuilding division has received a $1.47 billion, cost-plus-fixed-fee contract from the U.S. Navy for the detail design and construction of the amphibious transport dock LPD 30. The ship will be the 14th in the San Antonio class and the first Flight II LPD. Ingalls has delivered 11 San Antonio-class ships to the Navy and has two more under construction. Fort Lauderdale (LPD 28) will launch in 2020 and deliver in 2021; the keel for Richard M. McCool Jr. (LPD 29) will be laid later this year. Start of fabrication on LPD 30 is scheduled for 2020.